The Malice (2017. 451 pages) is the second in the Vagrant series of science fiction/fantasy books, written by Peter Newman. Initially released in its hardback edition, the book is now available in paperback. The story follows on many years after the conclusion of the first book. The Vagrant has found some form of peace and Vesper has grown from the child she was in the first book into a young woman and for fans of the first novel, there is another goat. The world in which Vesper finds herself is relatively unique in mixing science fiction and fantasy. In its past, at the foundation of the empire, this world was technologically advanced. Part of the book is a flash back to the planet's technological heights, the remnants of which are scattered all over the planet. We follow Massassi, who, following an accident, discovers that she can see the true essence of those around her. Moreover, she can see the growing Breach and the hordes of Infernal’s waiting on the other side of the Breach, waiting to invade. Going back in time gave the book another layer of world building which explained a lot about the post-apocalyptic landscape through which Vesper finds herself travelling. The twist in Vesper's story is that she has not actually been chosen by the sword, something we discover within the first two chapters. The Vagrant is resisting the call of the sword, but it is taking a toll. Vesper sees this and, when she discovers the sword, determines to get it away from her father. In doing so she is mistaken for the new barer of The Malice. She finds herself somewhere between fear and embarrassment and so goes along, even though the mission is to travel via skyship to close the breach. Instead the skyship crashes and Vesper, alone with only a goat and the remnants of her bodyguard, starts the long walk south. Vesper’s journey takes her to places previously visited in The Vagrant even meeting some old characters. Both Vesper and Masessi’s narratives are told from their point of view and are linear in their construction. Nothing wrong with that as Newman has delivered up a book which is even better than his debut. 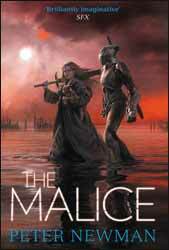 The Malice works well as a standalone novel, however, if you have come late to this series I suggest you start with the first novel in the series, The Vagrant.